According to CNN, Hillary Clinton is ahead of Donald Trump by double digits with just over three weeks until Election Day, according to a new national NBC News/Wall Street Journal poll conducted entirely after the second presidential debate. 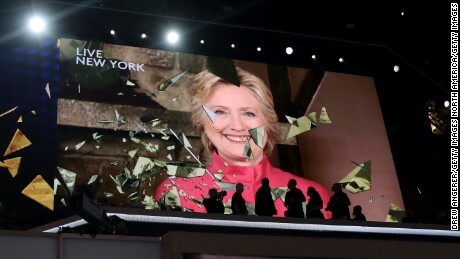 In a four-way race, Democrat Clinton holds an 11-point lead over Republican Trump among likely voters, 48 percent to 37 percent, with Libertarian Gary Johnson at 7 percent and the Green Party’s Jill Stein at 2 percent. 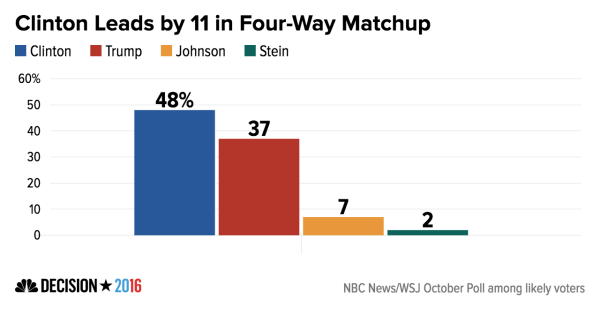 In a two-way contest without Johnson and Stein, Clinton is ahead by 10 points, 51 percent to 41 percent. An earlier NBC/WSJ poll — conducted two days after 2005 video surfaced of Trump making vulgar comments to describe kissing and groping women — found Clinton leading by double digits among likely voters. 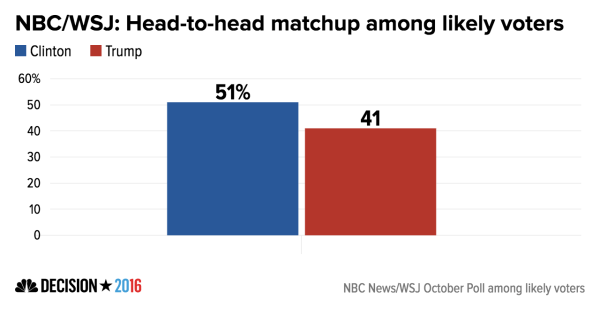 But after another day of polling taken immediately after the Oct. 9 debate, the entire Oct. 8-10 poll showed Clinton’s lead at nine points in the four-way contest (46 percent to 37 percent) and 10 points in a head-to-head race (50 percent to 40 percent). To put Clinton’s current 11-point lead into perspective, Barack Obama beat John McCain by seven points nationally in 2008. And Obama’s margin of victory over Mitt Romney in 2012 was four points.